Join Bobbie T.'s "Froggy Friends Club". North and South , East and West! all across our froggy nation! Your Bobbie T.'s "Froggy Friends" exclusive "Lifetime Membership" includes a personalized "Frog Wings" painted pin by Bobbie T.
The "Frog Wings" pin is your badge of honor in the club! As a "Froggy Friends Club Member", you will receive toadally exciting discounts, beginning with a 10% discount on supplies sold in the Studio and Bobbie T.'s Web site...even on Bobbie T. pattern packets already discounted at 50%!!! Future discounts and "Toady Tickets" will be in the offering for valuable savings on store purchases! Order your "Frog Wings" pin and Lifetime membership and start your day in a toadally awesome way! *Bobbie Takashima designs are copyright protected, any form of copying is strictly prohibited. * The Froggy Friends Club Membership discounts do not apply toward Class Projects, Fabric Items, Michele Walton Pattern Packets and Painted Items from Bobbie T.'s Art Gallery unless stated by Bobbie Takashima. *A personal croak from Froggy, AKA Toady. Thank you to all my toadally awesome painting friends for your encouragement and support for 40 + years! It is because of you that my excitement and passion for painting goes on. 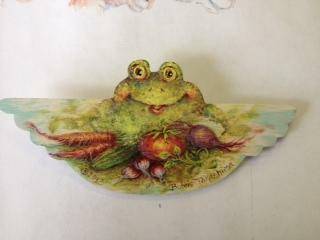 The "Froggy Friends Club" idea began the day that Jo Sonja Jansen so proudly wore the first "Frog Wings" pin! Words can't express how much I love and appreciate Jo Sonja , my teacher, mentor and friend. Soooo Froggies...we do have a Charter Froggy Friends Club Membership list, starting with Jo Sonja and many more dear friends in 2013 . The 2014 Membership list will be posted and hopefully your name will be on it! Many exciting projects and "frog stuff" is in our future! Bobbie T.'s "Frog Wings" pin is a copyrighted design and is exclusively given to members of Bobbie T.'s "Froggy Friends Club". copyright 2013 Bobbie Takashima all rights reserved.